Madge and Harold are trying to sort out the speech. 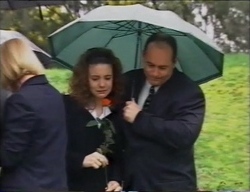 Jacinta Is telling Amy whilst Toadie is recording them, that she did switch Lances work. Carrying on from the recap, Toadie is filming the two girls talking. They get up when the bells goes, and start to head for class without looking back, until they heard a huge thump behind them. 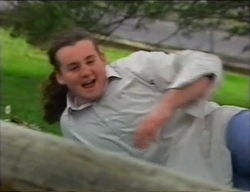 The girls turned round, to see Toadie lying flat out on the floor, having fallen off the branch.. Toadie then shouts at Jacinta and tells her that they have everything on, the confession and everything. She doesn't look impressed when she shouts at Amy, asking her ‘Did you know about this'. Amy just puts a blank look on her face, so Jacinta just storms off. 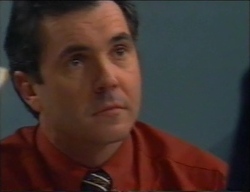 Harold is stressing over the speech he has been asked to do for Helens service. He says he can't think of words too big, or too small to describe her and how that's its really hard. Madge tells him to calm down and that he doesn't need to use lots of big and fancy words, but just to write exactly what comes from the heart, using memories and events that have happened. He then says, ‘she was a very very warm woman. Madge gets all teary eyed. Sarah bumps into Karl whilst she is carrying lots of files. He tells her that she doesn't have to do so much work, but she then comes back and says that she needs the money for Christmas. Susan walks in and tells Karl that she is going to have to stay late at work tonight as she has lots to do, Karl looks annoyed but agrees that if the work has to be done, then it has to be done. She tells him that she is applying for a new job, Karl doesn't want her to go for it. She kisses him and leaves. Karl turns to Sarah and says dinner for one, won't be much fun. Amy and Lance are showing the confession video. Lance laughs with pleasure. They hand him the tape and he kisses it with joy. They all laugh. They begin to talk about her telling Mrs K, but Lance says she isn't going to tell Mrs K, she knows what she is like and it isn't going to happen. Toadie and Lance begin to have a go at Amy, saying that shes sticking up for her, Amy denies this, but doesn't look convinced herself. Michael is talking to Debs about where he's going. Debbie says how nice it would be, he tells her to come with him. She says it's a nice offer, but she's needed here. Michael tells her tahts shes going to burn herself out. Jacinta walks into the coffee shop after Amy asked her to meet her. She comes in being all sarcastic asking where Toadie is with the camera, Amy tells her he isn't here and that she wants her to confess. At first she says no, but then realise that they could of already shown the tape to Mrs K, Amy starts to talk her round, and she begins to see sense. Everybody is in the kitchen, tip-toeing around. Hannah asks Phil will she be able to see Helen tomorrow at the service, or where she will be. Hannah gets upset, so Phil tells her to get a memory box and put all Helens favourite things in it. 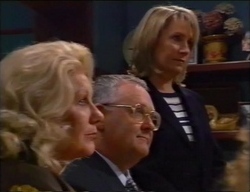 Michael and Debs go to help her. Karl comes home to find Susan still working on her application form. Susan asks where he has been so he tells her that he went for dinner with Sarah, she looks a bit annoyed but doesn't say anything about that, she then goes on to say that even though she said she was too busy to go out for dinner, she wasn't too busy to skip dinner and that you should of called me. 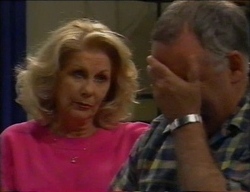 Karl apologises as Libby walks in late, Susan shouts ‘Why didn't you call? ', Libby tells her to calm down along with Karl, so she carries on doing her application. Hannah has finished her memory box and has just come in to show Phil. He looks very pleased with it and says its beautiful. Hannah says she feeling much better now. 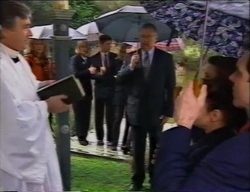 Michael then blurts out that Debs is going away with him, everybody looks shocked because she hadn't told anybody yet. Hannah gets upset saying that everybody is leaving her. Debs gets up in the middle of the night, and see Hannah in the kitchen. They talk about her leaving and how much Hannah will miss her. Debs says she wants to make the most of her life, and that shes not leaving her behind, she just needs some time on her own. They both start crying. It's mid-way through the service for Helen. Harold says his speech begins when he strats reading off his paer, he then pauses and says he doesn't need to read off some sheet of paper, his memories are all in his head. Some of the speech was…..
She was a lovely friend who we loved dearly. She never turned anybody back. Hannah begins to cry in Phils arms, he holds her tight whilst Harold finishes his speech. Toadie and Amy are sat out in the corridor waiting for Jacinta to confess. Mrs K comes out and tells them that Lance can come back this afternoon, they both looked pleased. They then ask how long Jacinta will be off for, Mrs K says a week suspension, she then leaves. Amy tells Jacinta that she would like to be friends with her still, she says she will think about it. Susan comes into the surgery and asks Sarah if Karl is free. She goes in and tells Karl that if she gets the job, then she is going to accept it. Karl looks disappointed. The family are having a sit down dinner in memory of Helen. Rosemary stands up and gives a little speech to them all. Ruth and Phil are in the kitchen washing up. Rosemary tells him that she is only one phone away. They all make a toast in memory of Helen.